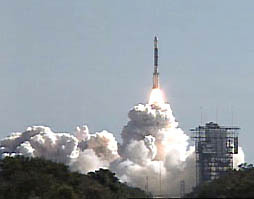 Top: Deep Impact lifted off January 12, 2005, at 1:47:08.574 PM ET from pad 17-B at Cape Canaveral Air Force Station, Florida, bound for Comet Tempel 1. Image courtesy NASA. 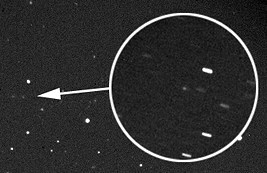 Bottom: Arrow points to Comet Tempel 1 photographed on December 11, 2004, by Observatoriode Begues, Spain. The plan is to create a crater by impacting the icy snowball on July 3-4, 2005, to see what it's made of. Image from Observatorio de Begues.